Welcome to the House of Pomba-gira! Faith and belief make up a very important part of our lives. A person's beliefs in many ways define who they are--how they see themselves, what they want out of life and most importantly, who they want to be. This web site offers an alternative path to spiritual fulfilment. 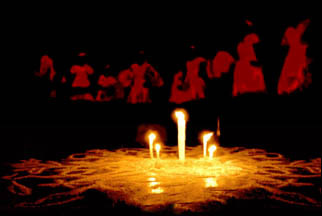 Exu Pomba-gira are a family of spirit-deities that are worshipped in the Afro-Brazilian tradition commonly called Umbanda. The aim of this site is to introduce you to these powerful beings. If you approach them with love and with faith they will transform you forever! Also included in this site are a number of links that will lead you further into this beautiful tradition and practice. Other, non-related, links are included for your interest. Thank you so much for visiting The House of Pomba-gira, please tell me what you think!